Want to prepare a tasty recipe and at the same time easy and quick to confection? 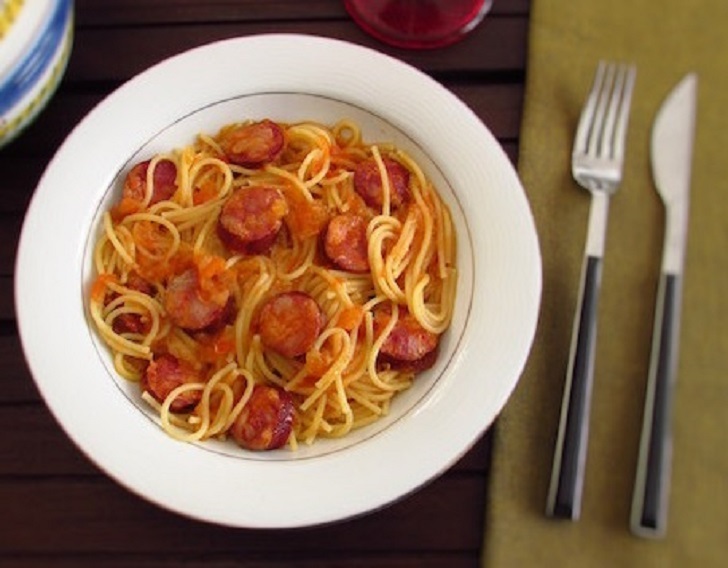 This spaghetti with sausages recipe is ideal for you! Try it! Place the olive oil, chopped onion, chopped cloves of garlic, bay leaf, the peeled tomato cut into small pieces and the sausages cut into round slices in a saucepan and cook over low heat until the tomato starts to break down. Pour the water, stir and bring to a boil over medium-high heat. When starts boiling, add the spaghetti and season with some salt. Stir and cook about ten minutes over low heat. Turn off the heat and serve.